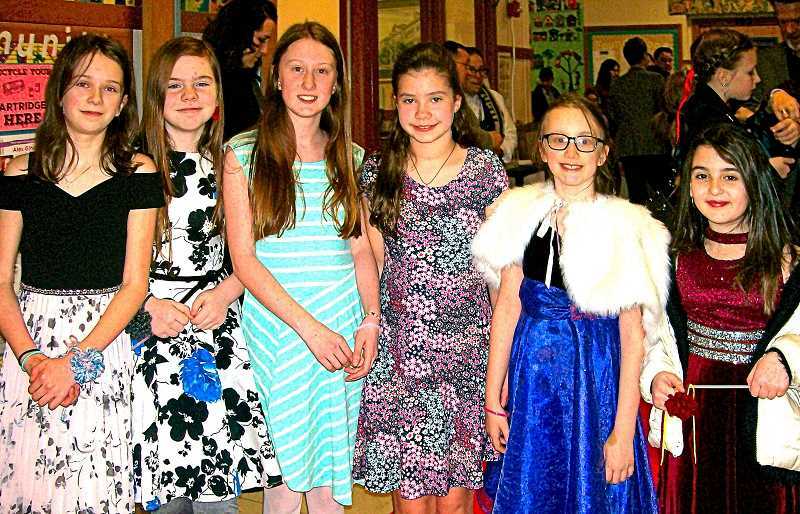 What started out in January as an unusually springlike winter abruptly turned cold and snowy in February, and one of the victims of the weather shift was the annual "Small-Tall Valentine Ball" at Llewellyn Elementary School in Westmoreland. But, it was just a postponement due to snow, not a cancellation. And the school's popular Parent-Student dance was successfully moved from February 8 to March 1. The paper "red carpet" lining the hall floors on that Friday night, the first of March, was rapidly demolished by excited students racing around to see their friends "all dressed up" for dancing with their parents. Pink, white, and red balloons and hearts decorated the darkened school gym – serving as the "Ballroom" for the night – supplemented by flashing colored lights, and a mirrored ball. A teacher acted as DJ and took song requests. Students wore lighted color bands from the entry table, to add a confetti of extra colors to the festive room. Parents, along with Principal Joe Galati, sold tickets and welcomed visitors in the front hall, and directed attendees to the gym, the hall snack tables, and to the photo booths in the Cafetorium. The entry fee income was designated to support the school's fourth and fifth grade overnight field trip. Additionally, students sold handmade yarn corsages near the entry to the gym to finance class projects, while proud parents in dress-up clothes arrived holding hands with their student "dates" before releasing them to the pandemonium of their first mini-prom. 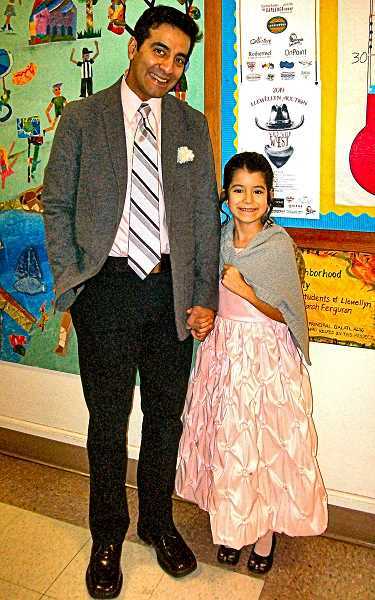 Boys wore suits and ties, and girls donned fancy dresses, jewelry, capes, tiaras, and even makeup. However, crowded onto the dance floor or around the refreshment tables, these elementary school students were still just kids, giggling and having a great time. Dance coordinators Amanda and Bryan Buck remarked, "We usually have between 250 and 300 attending. The fourth and fifth grade students' parents provide snacks. We even had some Llewellyn alumni volunteers from Sellwood Middle School come back to help this year, and to visit with their former teachers." This was the fifth year of the popular family fund-raiser at Llewellyn – but the first time one had been postponed by snow in February.